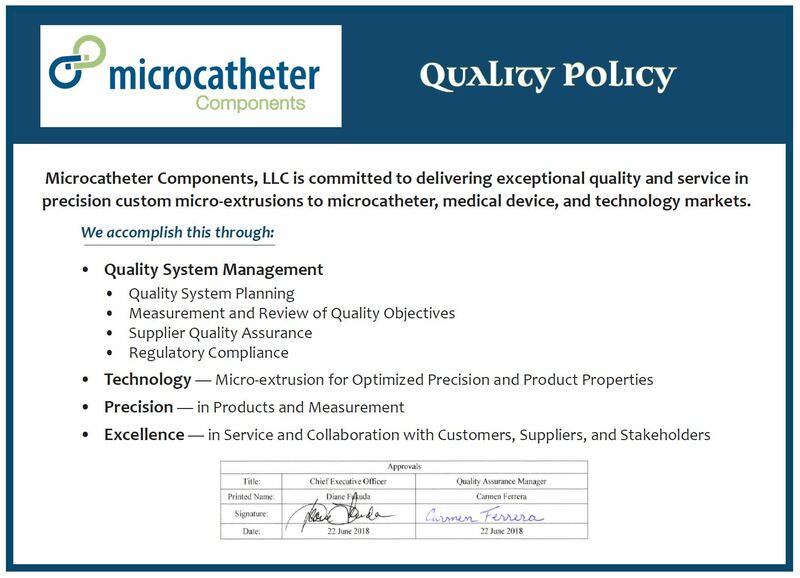 Microcatheter Components achieved its ISO 13485:2016 medical device certification on March 25, 2019. Every member of our staff was a part of this important accomplishment. Here on our website we have made our ISO 13485:2016 Certificate and our Quality Policy accessible for our stakeholders. Building a robust quality system doesn’t end with a certification. Our Quality Management System provides a basis for continuous improvement and control that benefits our customers and makes our business stronger. What delivers real value for our customers? What product attributes, although unstated in a product specification or a purchase order, are essential to our customers’ success? How can we compress the development time for the engineers who partner with us? Microcatheter Components delivers innovation and value, co-creating ideal supply partnerships with each customer who trusts us with their work. Our team strives to anticipate each customer’s needs, expanding our understanding through their feedback. It is how we build success for them, and for ourselves. For more on what drives us, check out our blog on the KANO model.